Celebrating the Jubilee of Mercy in Miao Diocese, a series of Retreat has been organized for different groups. The First Retreat in this series was held at Bishop’s House Miao from 29 February to 5 March. “Merciful like the Father” was the theme of the Retreat, preached by Rev. Fr. Panneer Selvam, Executive Secretary to the CBCI Commission for Proclamation. 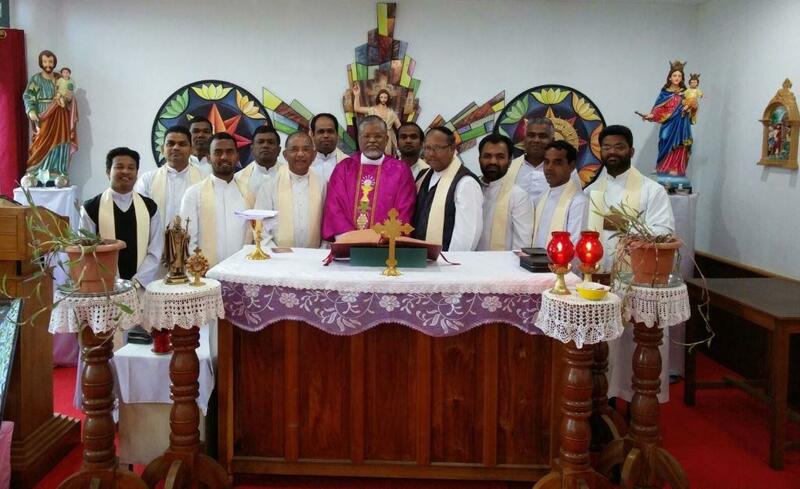 There were 13 Priests attending the Retreat. Fr. Panneer highlighted the “Mercy” of God with the these-based sessions on ‘Good Samaritan’, ‘Merciful Father’, ‘Sinfulness in All’, ‘Face of Mercy’, ‘Experience of Mercy by Faith’, ‘Spirit of Mercy’, ‘Works of Mercy’, and ‘Apostles of Mercy’. All the Priests attending the Retreat experienced the Mercy of God in depth and committed to New Evangelization and to be ‘agents of Mercy taking the Gospel of Mercy to the people under their care. The Retreat concluded with the “24 Hours for the Lord” Eucharistic Adoration on 5th March, joining the Universal Church in the Jubilee of Mercy event. The Retreat Preacher was very happy to see the commitment, cooperation, silence and dedicated participation in the Retreat.